Natrunsfar: First marathon after 3 babies...here we go! First marathon after 3 babies...here we go! 10 years and 3 babies later, the Ventura Marathon 2014 was my comeback with the goal of qualifying for Boston + running a PR (previous PR was 3:23 at the Chicago Marathon). We headed up to Ventura on Friday afternoon with all three kiddos in tow and checked into our hotel, which was right by the starting line. Lots of good sleep on Friday. 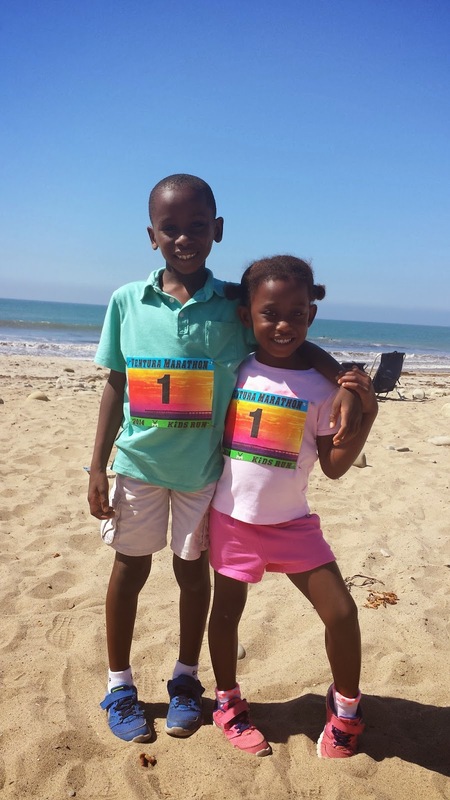 Saturday was a fun day on the beach with the kids as they ran the kids race and afterwards I picked up my bib number. Light dinner on Saturday evening and off to night night again. Wake up time - 2:30 am. Breakfast was a banana, bagel and a GU + water. Back to bed. 5:15 am - out the door for warm up run, stretching and one more bathroom stop. 6:30 am - Race begins! My race plan was to run 7:30 - 7:45 pace and things worked out where I was able to do exactly that. I hooked in with a small, fun group of men and women and we all supported each other in maintaining that pace. I felt so relaxed and ready for this moment. The taper was feeling great and my body was ready for the challenge. 7:30 - 7:41 pace until mile 18. UGH. Mile 18... Let me back up a bit. I felt myself slowing down just after the 1/2 way point. WHAT? This is too soon to be feeling this way. Saw my group starting to pull away from me and I really dug in and fought to catch back up and stay with them from 13.5 - 16. I felt myself slowing down again at mile 16 and again tried to fight the urge to slow down. Was still right at 7:35/7:40. Then, came the freeway overpass, which doesn't seem like a hill when you look at it, but at mile 17 - it feels like a HILL. Mile 18, I ran 8:02. Ouch, That hurts, What am I doing? My breathing felt fine, it was my legs that were taking a bit of a beating. "Keep my form" I kept telling myself. "Stay strong", "Remember those 800 meter repeats"
There was a very regretful 10 minute mile in there and then I felt myself sucking it up and giving it everything I had. I have never run the Boston Marathon. I have qualified twice before. The first time, I got injured and couldn't run. The second time, I was getting married and chose not to run. 3rd time has to be my charm, cause we're going to BOSTON!! I was slightly disappointed in my time, but I really can't be mad at my body. My body has given me 3 babies (with really tough pregnancies) and the 3rd baby was just 19 months old. 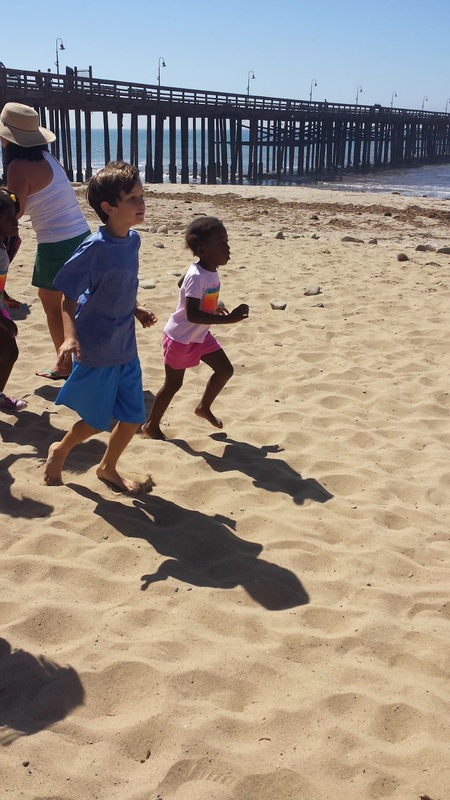 I had run a few shorter races, but had not raced a marathon since I had my children. It was so amazing to have my husband, children and my Mom at the finish line! There will be many more races and many more marathons in my future. But this was a sweet, sweet moment. Thank you body for coming through for me.